A year into using The Essential Planner and on the cusp of a New Year, I thought it might be fun to share how I’ve used my planner this year. At the heart of The Essential Planner is a a weekly double paged spread with a blank list on one side and a blank page on the other. This was the page I was really yearning for when I created the planner. So from the outset it’s pretty clear I don’t use my planner for diary management. In fact, I try to avoid the need for ‘diary management’ at all. By this I mean, I don’t over schedule my life. I avoid back to back appointments like the plague, even if those appointments are with myself. The things that do get diaried go into iCal in a couple of different calendars, one of which I share with my husband. For me the ability to be able to share and edit a calendar is so much simpler I honestly don’t see the need for a paper calendar. So why do I have a paper planner at all, I hear you ask. Well I love to write things down; my reminders, my dreams, my ponderings. There are two reasons I love the act of writing; one is that I swear if I physically write something down I am more inspired to do it, and two because there is strong evidence to suggest that writing things down actually has an effect on the way our brains interact with those things ie. it makes our dreams way more likely to become a reality. At the end of every month I sit down and note any key dates into my monthly calendar spread. This year I’ve added a specific section for noting down special occasions. I quite like having these all together in one clear place (helpful for remembering birthday cards and parties). I would love to say I sit down at the beginning of every week, with my blank weekly spread and map out the whole week (that would be very type A of me, wouldn’t it? ), but in truth I’m a bit more go with the flow than that. I do usually sit down on Monday morning and write down anything I know I really want to do that week. Often that is only one thing at the start of the week but I add as I go, by which time I’ve usually having ticked off some of the earlier items. I honestly find that if I give myself one thing to do, it gets done and then they next day I see where I am. Some weeks my list has been empty, other weeks I've had twelve things on the list, but I’ve yet to fill all seventeen spaces any week this year. For anyone who is wondering, how the list can be empty, the answer is this; some weeks just keeping the normal stuff running has been enough and so I haven’t added extra weight. To be clear the things I never put on my to do list are: laundry, food shopping, tidying. These things are everyday requirements and I systemise all of this (I’ll write a full blog post on this in a couple of weeks). Many weeks these regular requirements, plus my work hours, plus taking care of my kids is more than enough. As for the blank page I use it differently every week, and that’s exactly why I’ve left it blank. The varying things I’ve used this page for in 2018 include; work ideas, self care thoughts, manifestations for the solar eclipse. So, pretty varied. Many of you would probably be surprised to see how blank my planner actually is but that is precisely the point. Blank means I’m giving myself a bit of space, some free time, because as you know, if you have a business/job, a family and home to take care of, you always have enough going on. 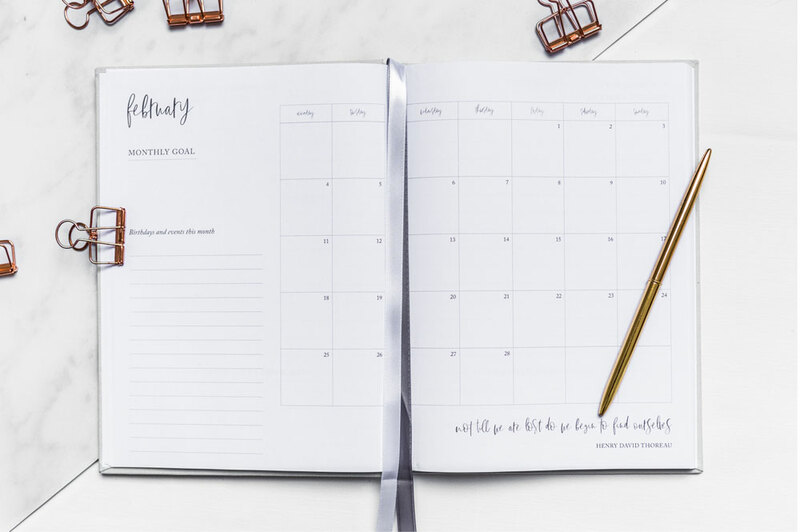 The Essential Planner is a little piece of organisation in my full life; a tool to keep everything I do want to do together in one (luxuriously bound) place. Let me know your questions about the planner, my organisation tactics or anything else you’d like to know.